just came back from my colleague, Wilson's wedding. 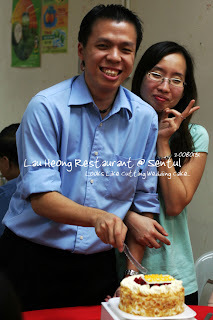 It was held at Royal China, Jalan Ampang. Happy wedding and may both of u be blessed with unbound happiness and joy. my 2nd visit to Sakae Sushi, this time at Pavillion outlet. we had a movie to catch so we had a quick lunch..
soft shell crab temaki ~ this one..i reli have no comment.. Overall, the food is out of expectation. I had a good try at Sakae Sushi in Bukit Tinggi but this one is reli dissapointment. Sashimis were not fresh, sushi tasted below normal. I personally thinks that Genki Sushi and Sushi King taste so much better...My friend says the food here lacks the "oommphh..."
i guess won't be returning anytime soon to this place..
and we had McD delivery for dinner. lazy to go out coz we were stil gambling..haha..but McD tasted too good last nite with the companions of the jimuis. all ur "yee yee" are so excited for ur arrival..we cant wait to see you and for now we wish that u stay healthy and dont make your mommy too restless..be a good girl and get ready to be shower with gifts from all the " yee yee"
burfday dinner with jimuis was at The Apartment, The Curve..
heard lots of not so good reviews about it bout we still decide to go ahead and give it a try..
estee message me telling me that she wouldn't be able to make it coz she will finish work very late but will ask eric to stop by and pass me a burfday present.so when i arrive at about 8.30 i gave eric a call and waited for him in front of The Apartment, and when i saw him, estee came from behind..she was the present...I WAS SURPRISE ! was reli feeling so hapy coz estee manage to make it to the dinner. a simple introduction about "The Apartment" - the whole restaurant is renovated like an apartment.They have bedroom area, kitchen area, dining hall area, study room area and even bathroom. we sat at the bathroom area. "roasted stuff chicken" served with crispy herb bread topped with mushroom cream sauce and baked potatoes and tomatoes ~ price at rm26.90. i like the crispy herb bread. the chicken tasted normal. apartment sauce mussels(honey,lime,chilli & ginger) ~ price at rm12.90 ( u can opt for clams if u dont so like mussels ) The mussels are very fresh. They are a variety of sauce for u to choose from. "baked fish"-baked dory topped with cherry tomatoes ith gratin of mozarella and parmesan with saute potatoes ~ price at rm19.90. I think the mozarella and parmesan is a bit too much that is covers up the taste of the fish. "stuffed squid" -stuffed squids with shallots, mint, parsley, and parmesan in tomato white wine sauce ~ price at rm16.90. this dish has all the jimuis votes.squid was very fresh and the sauce goes very well with the freshly toasted bread. THUMBS UP !! "jamie's duck pasta" - fettuccine with shredded slow-roasted duck and tomoto red wine ragu,topped with roasted pine nuts ~ price at rm23.90. "andrews pasta" -sauteed potatoes and asparagus tossed with linguine and pesto ~ price at rm14.90.another dish that has all the jimuis votes..YUMMY !! "crunchy walnut crepes" - richly texture crepe with brown sugar and crushed walnut smooth in an avalanche of sweet caramel sauce ~ price at rm6.90. my 2 burfday cupcakes that Joyce bought for me! i know she took the effort to walk to the newly open cupcake shop and bought it.Thank u !! i love the cupcakes so much.on the left is chocolate vanilla and on the left is cheese with chocolate ) Both also very very tasty ! and lastly some pics that i wan to share with all of u.
I had a great night. Thank u so much for taking the effort to celebrate my burfday. i know all of u took some precious time of urs to have this dinner wif me and some travelling from far to come to this dinner. i appreciate it. i knows its not the complete 7 of us(again..) but i stil had lots of fun. Thank u for making me so hapy and so touched.Thank u for all the surprises ! i simply love u all !! Its my burfday today (15th Feb) n i really had a great day, a real great day with surprises and eating. Thanks to my colleagues for the great lunch and the cake. Thanks to my jimuis for the surprise...i so-the-tak-sampai-hati to eat the chocolates. lunch..my colleagues treat..THANK U SO MUCH !! I LOVE U ALL SO MUCH !! Thank u for treating me to a very nice lunch..i just adore all of u !! they decided to bring me to Pavillion for japanese food and our destination was Ichiban Boshi. "sashimi mori oki" ( for 3 to 4 pax) ~ price at rm39.90. Very fresh sashimis ! some of the food that my colleagues ordered but i have no idea at all wat are the names of this dishes..
Lastly, a group pic of me and my lovely colleagues..Thank u so much for making my day..I M SO HAPY !! THANK U SO MUCH !! Besides thank u, i duno wat more to say. "Terima kasih" for making my day such a memorable one..i promise, i'll never forget i have such a bunch of lovely and crazee colleagues. The thought of helping me to celebrate means a lot to me. I m reli touched..THANK U ! p/s : stay tune for my dinner with my jimuis..
we had an early burfday celebration for wilson at this restaurant in Sentul name Lau Heong Seafood Restaurant. Its truly a hidden treasure inside Sentul. If you are familiar with Jalan Genting Klang, i think its shoudn't be difficult to find this place. Total 10 of us. crispy skin pork knuckle - i love this dish so much...the sauce was so nice and the pork skin was so crispy and the meat was tender n juicy..THUMBS UP!! "siong tong la la" - another dish i defintely heart. the soup was very flavourful and lots of wolfberries were added to the soup and the freshness of the la la definetely enhanced the taste of the soup..YUMMY !! sizzling calamari and prawns - another must order dish if u dine at this restaurant.u can see that every single table who dine there order this and i must day the calamaris and the prawns are very fresh ! and the sauce..i m not sure wat sauce it is but definitely it has all our votes that it is very very tasty ! i forgot the name of this dish..i think its some kind of steam sauce with sting ray. haha, i know the picture doesnt look nice but never judge a book by its cover..it tasted not bad but a bit too spicy for those who cant take spicy food. We bought a cake for Wilson's burfday and we had it as dessert. ohh hoo....i heart this cake a lot too..first, its has my favourite fruit ~ strawberries... and the texture of the cake was soft with some cream and strawberries inside...definitely HEART it.. hope the burfday boy and my other colleagues love this cake as much as i do ! Overall, its a very good dinner with lots of silly jokes...and i seriously recommend this restaurant to u peeps put there..and the total bill came up to RM190 for the 10 of us (excluding the cake).Do give it a try if u are around Setapak area.